If you want to carry tons of documents around with you without a laptop or PDA—like if you’re going from home to office, or vice versa—there’s nothing more convenient than a USB flash drive, those increasingly ubiquitous little thumb-shaped storage devices that plug into any computer’s USB port. The downside is that if you’ve got sensitive information stored on one, you have to live with the paranoia of that info falling into the wrong hands (USB flash drives are easy to leave behind precisely because they’re so tiny). 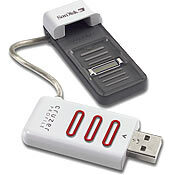 Enter the new SanDisk Cruzer Profile Biometric USB Flash Drive. Amazingly, it’s not much more expensive than the zillions of other basic USB flash drives on the market, and unlike competing fingerprint-protected products, this baby is a two-part device that has its fingerprint sensor on a flexible tether, which makes it easy to use from any angle. It’s compatible with Windows XP, Windows 2000, Windows ME, Mac OS 10.1.2+ and Mac OS 9.2.1+. $69.95 at adorama.com for the 512 MB model; $119.95 for the 1 GB model.